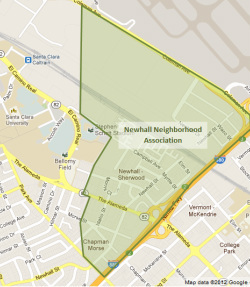 The Newhall Neighborhood Association, founded in 1991, builds community and advocates responsible development on behalf of residents and businesses of the western gateway to San Jose, California. The Newhall Neighborhood Association's boundaries are Coleman Avenue, Interstate 880, Park Avenue, and the Santa Clara city border. Annual dues are paid in January and are currently just $10. All funding goes back into the community for activities such as neighborhood cleanup, social events, National Night Out, education, and outreach. You can bring your dues to any Newhall Neighborhood Association meeting or give them to any board member. The Association meets quarterly. Meeting announcements (date, time, and location) are generally made in the printed quarterly newsletter and are posted to the Association's email group and website. All are welcome and encouraged to attend! The Newhall neighborhood also contains two homeowners associations (HOAs). In contrast to the Newhall Neighborhood Association, which generally works with the City of San Jose and other government groups, the HOAs are funded by mandatory payments from homeowners living inside particular developments. HOAs have legal and financial responsibilities for maintaining certain common areas & infrastructure, as well as upholding community architectural standards.